A ghost ship. A girl with no memory, adrift in time. An old enemy. This could be Charlotte Pollard’s finest hour – or her last. 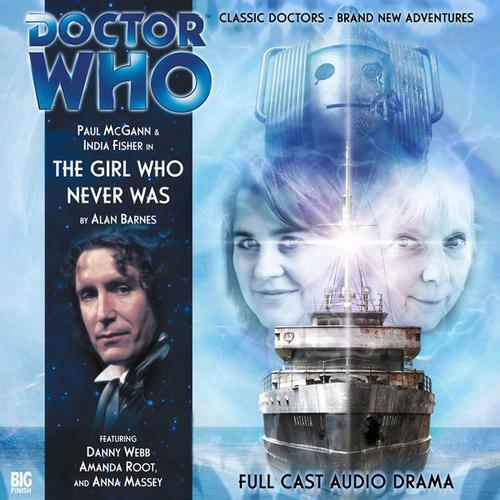 Paul McGann is the Doctor in The Girl Who Never Was. Every story will come to an end. Friends graduate and go their separate ways. A beloved movie trilogy or television show has its final episode. The concluding book in a series is published. A newspaper or Internet column puts up its last words. And beloved companions say goodbye. Every story should come to an end. Things simply aren’t meant to last forever. Emotions, finances, fatigue, entropy, or sometimes there simply are no more stories that need to be told. It’s often bittersweet, sometimes celebratory, but always necessary to know when to walk away and more importantly to know when to let someone or something walk away. The Girl Who Never Was is Charlotte Pollard’s final story with the Eighth Doctor, and she goes out in fine style. In stark contrast to C’rizz’s farewell in Absolution, this tale is packed with twists and turns (although some are predictable), some fine performances (and some cringeworthy), a classic villain (with a typically convoluted scheme), and several great examples of the chemistry between India Fisher and Paul McGann that has defined their audio relationship. As an overall story, The Girl Who Never Was is pretty good and rather enjoyable. As a farewell story, it works on every level that such a tale needs to and gives Charley the opportunity to go out on a very high note. The “creator” of Charlotte Pollard, veteran Doctor Who writer Alan Barnes, returns to write her final episode. Not only is Barnes a fine writer with plenty of novel and comic experience until his belt, but when it comes to Charley’s overall character arc, Barnes has penned the keystone stories – Storm Warning, Neverland, Zagreus, The Next Life, and now The Girl Who Never Was. Barnes’ script for this story follows his standard blueprint, creating a serviceable, solid story that relies on the relationship between Charley and the Doctor to carry the day. Barnes starts off with an appropriately creepy setting, a old tramp freighter that escaped from Singapore during the Japanese invasion, the SS Batavia. The ship vanished in the Karimata Strait, assumed sunk by a Japanese torpedo. 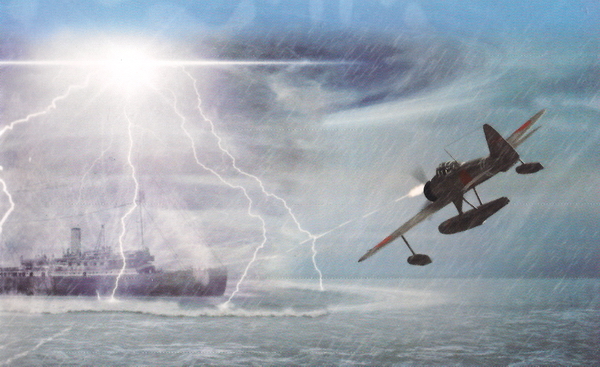 But during intense electrical storms, captains have reported see the freighter floating in the distance before suddenly vanishing from sight and from radar. The premise of an abandoned ship with no bodies on boards is one Doctor Who has done time and time before, way back in the First Doctor story The Chase, but also appeals to me on a personal level as a fan of stories like Ghost Ship and Dead Space, with a lick of The Philadelphia Experiment thrown in. Barnes throws in some snappy dialogue, a bit of decent characterization and interaction, and three pretty solid cliffhangers and a gripping finale. If The Girl Who Never Was was simply a tale of a haunted ship and greedy sailors interested in salvage, it would have been a solid adventure audio. But Barnes raises the stakes as appropriate for a farewell story be introducing a foe Charley has met before – the Cybermen. Charley had met the Cybermen during her second adventure with the Doctor in the story Sword of Orion. These are the old style Telos/Mondas Cybermen of the buzzing voices and overriding motive of “we muzzzzzt survive.” Their reveal at the end of the second episode is greeting by the tell-tale stomping metal footsteps and “you will become like us” would have ranked as one of the greatest cliffhangers in the history of Big Finish…if the CD cover hadn’t spoiled their appearance. Still, the Cybermen themselves are presented very well in this story. Their motive is survival of their race by conversion – first of the humans onboard the SS Batavia, than of the rest of humanity, with a neat twist involving time travel (or “translation” as the Cybermen call it) and a stranded Cybermen time-ship in the year 500,002 A.D. These Cybermen are trapped in their own circle of logic, unable to act without their orders being confirmed or updated by the Cyberplanner, and their final fate is a well-done circle of logic that locks them in their own temporal loop. It’s one of the finest examples of the Cybermen so far for Big Finish (after Spare Parts and an upcoming Eight Doctor Adventures story) and one miles better than most of their revival appearances, especially since Nicholas Briggs NAILS the voice and cadence of the old school Cybermen. The human supporting cast varies from the “wow, that’s kind of racist” accents of the hotel receptionist and a police detective on the streets of Singapore to Amanda Root’s solid performance as Madeline Fairweather, the token female character on a ship full of blokes (her “reveal” is supposed to be a surprise, but her “male” voice is so obviously female it’s not a surprise at all). Veteran British actress Anna Massey plays Miss Pollard, revealed as part of the first episode cliffhanger. Massey plays the older “seen it all” character who doesn’t have time for the gruff of a young man, and both her and Barnes present a hint of mystery…this person can’t possibly be Charlotte Pollard, could she? Maybe, with all the time-travel shenanigans going to and fro. The standout secondary character is Danny Webb, who plays two versions of the character Byron, one on 1942 and one in 2008. Known to Who fans as John Jefferson from The Impossible Planet/The Satan Pit, Webb plays the smarmy, greedy, slimy Australian scallywag almost as the mirror image of the Doctor. Where the Doctor is cautious, Byron is greedy to the point of recklessness. Where the Doctor is wary of the Cybermen, Byron immediately cuts a deal with them. When the Doctor knows it’s time to go, Byron tries to go even further. Byron’s final fate before his final fate isn’t a surprise, and leads into Charley’s final moments in the TARDIS. There is a bit of charm in Webb’s performance, just enough to make the listener think Byron might be redeemed and feel just a bit of “oh, you fool” at his demise. During C’rizz’s time in the TARDIS, I felt that Paul McGann’s performance spent more time in neutral than in gear, and he never really clicked with the alien companion. When the Doctor was on his own, there was a hint of a spark in McGann’s dialogue. But it’s when McGann was opposite Indian Fisher that he truly shined. 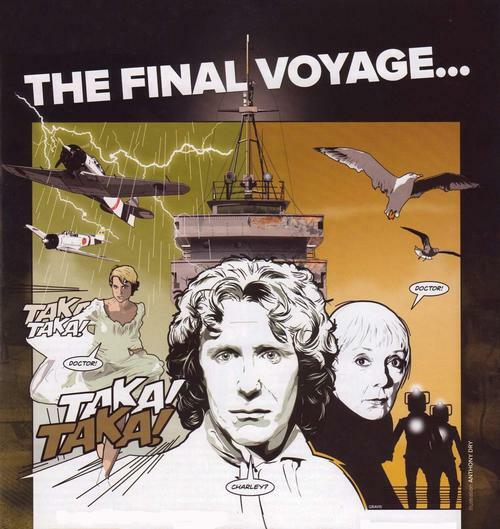 Even though the Doctor and Charley spend most of The Girl Who Never Was separated by events, the listener can sense the eagerness and sense of adventure in McGann’s voice. He doesn’t want Charley to go, and those moments where he believes she’s truly lost to him are emotionally gripping. But until then, he’s still trying to tempt her into more adventures, almost to the point of ignoring her concerns about traveling with him and his lack of empathy towards C’rizz’s death. In a farewell story that’s about Charley, McGann does a damn good turn in showing just WHY Charley was so important to him, not just in the natural wit and back-and-forth banter, but with something deeper, the non-romantic love between them. McGann’s no slouch during the rest of the story, mind you. His dialogue with Miss Pollard adds to the mystery that this older woman just might be Charley just by how natural and free-flowing the chemistry is between McGann and Anna Massey, and there are plenty of “Doctor” moments where Eight’s quiet “you really don’t want to do that’s” and his “not quite shouting levels of anger” are on display. It’s a great balance by McGann – Eight’s boundless energy disguising his sadness at Charley’s departure. One of the big concerns with Absolution was that, even though it was his farewell story, C’rizz really didn’t tie into the story’s major events which made his presence almost an afterthought. There’s none of that here, as Barnes put Charley right into the heart of the action. India Fisher doesn’t hold back in her final performance with the Eighth Doctor. Her anger at the beginning of the story is a little childish and petulant, but it comes from the place of a young woman who knows that she’s reached the end of her travels and is just showing it in the way a young woman might. As Charley gets drawn into the events involving the Cybermen, her determination to leave is mixed with her “enjoyment” at the action. She might not like events as they happen, but there’s no denying the thrill of adventure Charley experiences with the Doctor, the most oddest man she’s ever met. Barnes’ script mixes Charley in charge with Charley under guard and even Charley under the thrall of the Cybermen as the heir-apparent to the throne of the Cyberplanner, and Fisher is wonderful in all of her parts, even in this final moments where, in a way, she’s the Doctor helping defeat the threat of the Cybermen through clever thinking and some improvisation. I can’t praise Fisher’s turn her enough, as The Girl Who Nevers Was does what Absolution couldn’t – show just how competent Charley is without the Doctor at her side as well as showing just as amazing she is WHEN the Doctor is at her side (and vice versa). There’s a bit of a fake-out at one point as the Doctor attempts to save Charley’s brain from being burned out by a Cyberman virus by hypnotizing her to forget their travels together (ala Journey’s End, and here I am contractually obligated to say I still haven’t forgiven RTD for what he did to Donna). It’s a moment that could have been heartbreaking as the Doctor tries to explain to an amnesiac Charley what happened without triggering her memories…but sometimes, enough wonderful things happen that your brain just goes “sod it” and refuses to forget them, and it’s a great little scene that, even though it’s the end, reaffirms the Charley/Eight dynamic. But there’s a final twist involving Byron and the Cybermen’s time ship, the Doctor being “killed,” and Charley sacrificing herself in the year 500,002 to ensure the Cybermen are locked in their closed time loop and Byron meets his just fate. Dear Doctor. It’s been such a long journey for both of us. I never, ever wanted it to end, but end it has. We both know that. A long time ago now, I said you were the oddest man I’d ever met. You’re that still. You’re the best man I’ve ever met too. But we’ve chanced our luck once too often, I think, so I’m bailing out. Escape strategy number five. I’m going to disappear. There’s no freedom like being dead. I can go anywhere, be anyone I want. Just like a Time Lord really. Don’t look for me, please. But remember me. I’ll remember you, always. With love, The Girl Who Never Was. This letter sums up everything about the relationship between Charley and Eight. The Girl Who Never Was is a grand finale for Charlotte Pollard – Cybermen, temporal twists and turns, her possible existence outside the Web of Time, and a final sacrifice to ensure the safety and survival of the Doctor. Alan Barnes gives India Fisher (and Paul McGann) everything she needs to send her out in style, giving her the final word and adding the final coda to her and the Doctor’s time together. This was one was a bit hard for me. Eight is MY Doctor, and Charley was a grand companion. I know Lucie Miller and Molly O’Sullivan are coming up, and it’s going to get even more heartbreaking…but I know how the story goes. And so does the Doctor. You work in a hotel. You should know. Everybody leaves. Cobi’s Synopsis – Journey’s end for Charlotte Pollard, as The Girl Who Never Was sends her off in grand style at the hands of the Cybermen, India Fisher’s chemistry with Paul McGann on full display all the way to the poignant ending. Charley, having made a crystal set out of the remains of the destroyed Cybership, sits on an abandoned Earth tapping out an S.O.S, a signal in a bottle out into a vast temporal sea, knowing that somewhere, somehow, the Doctor will be listening…and the familiar wheezing groan of the TARDIS is her salvation. But the man inside the TARDIS wasn’t who she expected. A man in a patchwork coat of many colors. This entry was posted in Big Finish Review and tagged Big Finish, Big Finish Audio, Big Finish Review, Charley Pollard, cybermen, Doctor Who, Doctor Who Audio, Doctor Who Review, Eighth Doctor, India Fisher, paul mcgann, TARDIS. Bookmark the permalink. I love this story, and I found it’s dialogue extremely witty and enjoyable, the Doctor and Charley are on top form. I’m an avid follower of your reviews, a question, are you planning to review the Eighth doctor adventures with Lucie? As for Lucie “bleeding” Miller, I will…eventually. With the new television season kicking off, I’m taking a break from doing audio reviews from now until the Christmas special. I’m going to focus on the new season and keep doing some of the classic Tom Baker episodes, and along the way I hope to review the other Big Finish releases (“Doom Coalition,” “Torchwood,” “Jago and Litefoot and Strax”) as they’re released so I can review “current” stuff for once! Once the New Year kicks off, I’m going to dive into the Eight Doctor Adventures/Dark Eyes stuff before jumping back to the main range.